If your shower faucet is leaking, its valve stem is probably worn out and needs to be replaced. 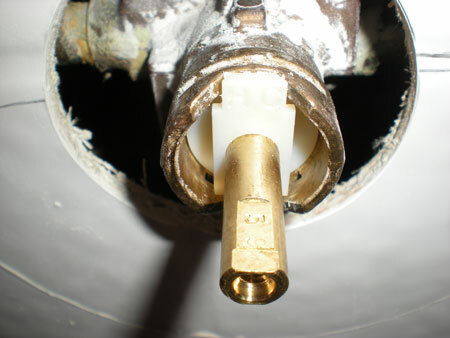 It is a common problem with old showers and the only solution is replacement of the rubber washers in the valve stem. To replace the washers, you need to disassemble your faucet valve stem, remove the damaged cartridge and install a newer one. Cut the water supply to the Kohler shower. There are no separate shut off valves for the shower faucets, so you will need to turn off the main water supply to your house. Once you have turned the water supply off, rotate the tap to the Kohler shower faucet to release the water present in the pipelines. Remove the screw holding the shower handle in place by turning it anticlockwise with a screwdriver. This screw is usually present on the bottom of the handle, if not there, locate it underneath the decorative cap of the handle. Once you have unscrewed the Allen nut, remove the handle by pulling it straight off. Remove the decorative plate behind the shower faucet handle by removing the screws located on the face of the plate with a screwdriver before pulling the escutcheon off the wall with a pair of pliers. Using an adjustable wrench, unscrew and remove the bonnet nut (a large nut surrounding the valve stem) to reveal the faucet assembly. Once the faucet assembly has been unveiled, just pull it off using a ratchet-wrench. Fix a deep socket at the end of the wrench and turn it around the valve stem until it fits tightly. Turn the valve assembly in the counter clockwise direction until it is loose and then pull it straight out. Insert the valve assembly into the wall and fix it in place using the same socket wrench that you had used to remove the worn stem. This time turn the faucet assembly and wrench in the clockwise direction. Replace the bonnet nut over the faucet assembly and tighten it with the adjustable wrench. Put back the escutcheon plate and fix it in place by tightening the screws with a Phillips-head screwdriver. In the end, slide the faucet handle over the tip of the valve assembly and fix the screws in the centre of the handle with a screwdriver.